Beekman Bank | Historic Jacksonville, Inc. The Beekman Bank, constructed around 1863, was the only wooden commercial building on California Street to survive Jacksonville’s numerous fires. When Cornelius C. Beekman purchased this lot, he had already been in Jacksonville for almost 10 years. In 1853, Beekman had obtained a job with Cram, Rogers & Company, an express company in Yreka, as a “connecting agent” in the new mining town of Jacksonville, Oregon. Beekman himself rode over the Siskiyou Mountains two or three times a week from Jacksonville to Yreka carrying gold dust, parcels, and letters for miners and settlers. Cram, Rogers & Company failed in 1856, and Beekman purchased their Jacksonville stables and corral for $100, establishing Beekman’s Express. He initially operated out of a one-story structure that he shared with Dr. Charles Brooks’ Drugstore on the southeast corner of California and Third streets. 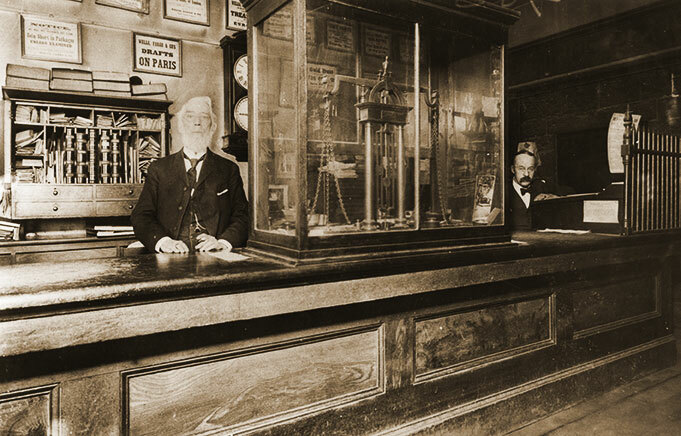 Beekman also acquired a large safe and used the Beekman Express structure as a “gold dust office.” In 1857, Beekman’s office became the first “bank” in Southern Oregon and the oldest financial institution in the Pacific Northwest. When Beekman built this structure in 1863, he ceased being an express rider and became a Wells Fargo agent. The stage stopped along side the bank so potential robbers never knew when Beekman was shipping gold. During Jacksonville’s heyday in the late 1800s, some $10 million in gold reportedly passed across his counters–worth about $1 billion today. Beekman ran his bank with a personal touch. When someone wanted to borrow money, he had to approve the request. If the individual was trustworthy and the investment sound, he loaned his own money rather than that of the bank. However, rather than paying interest on customer deposits, Beekman charged the depositors for storage. Beekman also sold books, supplies, and stationery and fire insurance out of the bank. By 1912, Beekman had competition from the Bank of Jacksonville, new banking regulations had been introduced, and most businesses had moved to Medford. He officially announced the closure of his bank that year, but continued to operate for his old customers until 1915, the year he died. At his death the doors were closed, and the Bank building remains as it was when Beekman operated it. A “Viewing Room” is periodically open to the public, providing visitors with limited access to this historic landmark. Candlelight “Secrets & Mysteries of the Beekman Bank” tours are offered on the first Friday and Saturday of the month from January through May (times vary by month). “Behind the Counter” tours are available between 11 am and 4 pm, Friday through Monday, from Memorial Day weekend through Labor Day and during Jacksonville Victorian Christmas weekends. Private tours are also available for groups of 10 or more.